Ahhh burgers…the bane of my existence. So tasty, so scrumptious…the perfect antidote to even the most beneficial of health regimes. Come November this humble Tasmanian Burger Challenge is going global! Can the likes of The Standard, The Winston and Red Jaffa stack up against the European heavyweights? Only time and our over-excited taste buds will tell! Until then, we’ve still got a few home grown burgers up our grubby sleeves to keep you salivating. Our latest adventure took us to Salamanca Wharf Cafe, down on Castray Esplanade. 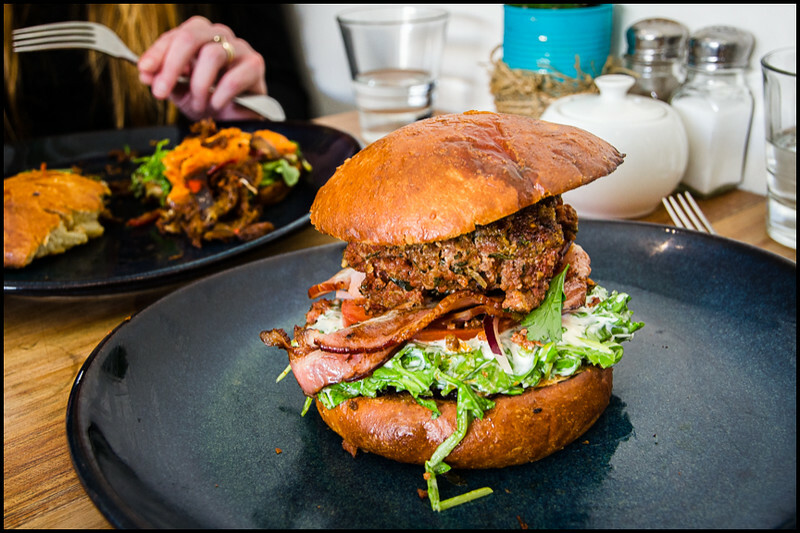 Not as well known as the big boys of Hobart’s burger scene, but the online whispers had us intrigued. Part and parcel of the Salamanca Wharf Hotel, we were pleasantly surprised to find the vibe decidedly un-hotel-ish. Polished concrete floors, super trendy knick-knacks for sale by local designer Lucy Given of Luc Design, and your very own table cactus for a splash of green. Close proximity to Hobart’s waterfront district means the foot traffic is steady, and its patrons a welcome mix of both locals and tourists alike. Breakfasts seem to be their ‘thing’, but the lunch menu has a very tidy selection of burgers, ranging from pork to vegetarian to Thai beef. All are $15 and all, including the buns, are made from scratch! They even do a home made gluten free bun as well. A good ol’ beef burger for me (of course!). Ground beef, bacon, beetroot chilli jam, tomato, red onion, roquette and aioli. It’s hard to believe that it’s taken three years and 24 burgers for this moment to arrive…I’ve finally come across a burger that isn’t ‘stuffable’!! Believe me, I tried. All I could manage for my efforts was a squirt of aioli out the back and crumbs down my front! It was with much reluctance that I took up knife and fork and proceeded to treat it like a regular meal. Not ideal. In one word, the beef burger from Salamanca Wharf Cafe is ‘promising’. The roughly rounded and inch thick beef patty was nicely seasoned, and the judicious use of herbs a point of difference to other burgers. The generous dollop of nicely bitey aioli went some way towards making up for the lack of moisture, but it was too late, the balance was out of whack. As nice as they were, even the freshly baked bun and crisp bacon rasher couldn’t save it’s beefy hide. I can’t be too critical though, as a new chef had apparently joined the team and their familiarity with the menu was still a work in progress. A shame, but it’s one of those experiences that beckons a return visit. The promise was there, and with more experienced execution (a thinner, wider patty essential! ), I’d say they have the makings of one very tasty burger. Karen ordered the lamb burger. 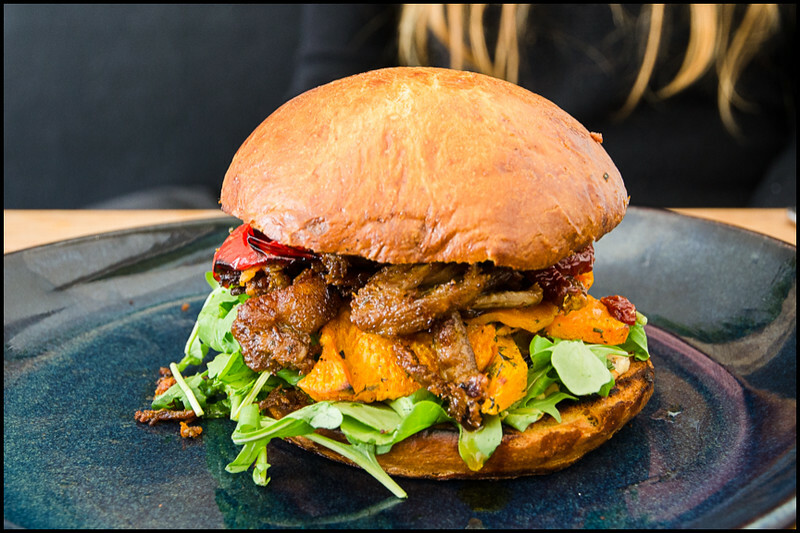 Harissa spiced pulled lamb shoulder, roast capsicum, pumpkin, sun-dried tomato and capsicum pesto, aioli and roquette. Now we’re talking! Slow cooked lamb is always a winner, no matter what the form. The interesting use of pumpkin and capsicum was such a great match. As winter creeps coldly ever closer, I can see this being the perfect antidote! 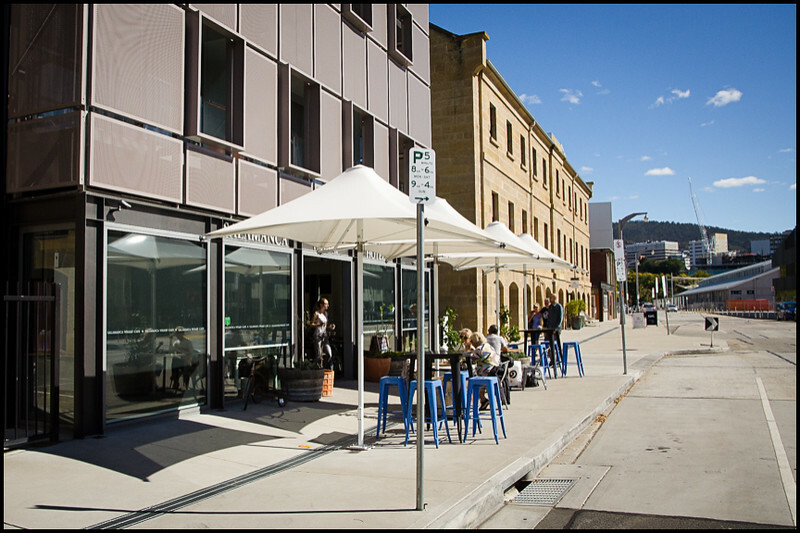 Overall thoughts on Salamanca Wharf Cafe? The smiles were plentiful, the service friendly and the food satisfying. 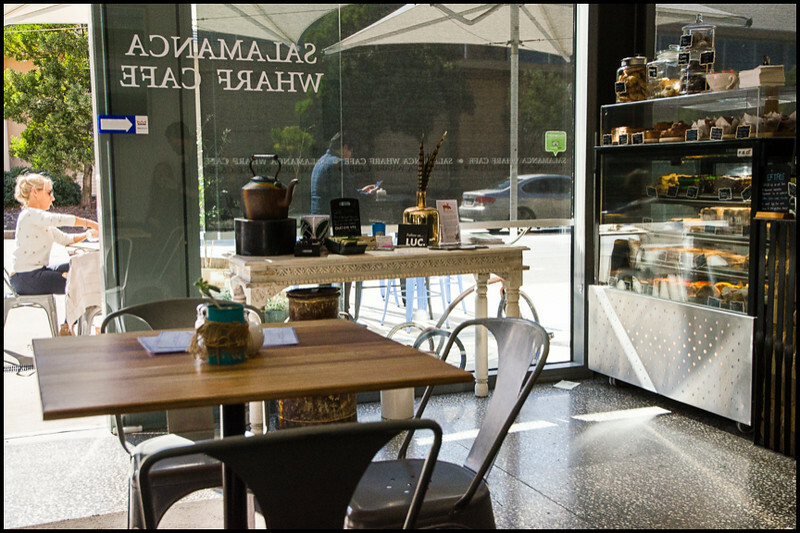 The pastries, hot breakfasts and burgers on offer also present what we consider to be pretty good value for the Salamanca precinct. Try them, tell us what you think!